Be the first to share your favorite memory, photo or story of Harry "Jack". This memorial page is dedicated for family, friends and future generations to celebrate the life of their loved one. 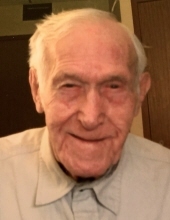 Harry ‘Jack’ Jackson Allender, a resident of the Pheasant Run Community, Kerens, passed from this life Sunday, January 20, 2019, at Cortland Acres Nursing Home. Jack was born Saturday, February 5, 1927, in Weston, a son of the late Franklin Pierce Allender and Mary Magdalene Ervin Allender. On December 31, 1953, in Oakland, MD, he was married to the former Doris Maxine Ward, who survives. Left to cherish Jack’s memory is one daughter, Penny Tuesing and husband, Fred of Hambleton, one son, Jacky W. Allender and wife, Carrie of Pheasant Run, one stepson, Paul Richard “Rick” Ward of Pheasant Run, six grandchildren, Ricky Ward, Misty Ritter, Joyce Kencel, Haley Allender, Wesley Allender, and Dennis “DJ” Wolford, and several great-grandchildren, nieces, and nephews. Jack was the last surviving member of his immediate family having been preceded in death by six siblings, Victor Allender, Robert “Bob” Allender, Irene Wingfield, Mildred Allen, Louise Murphy, and Wanda Summerfield, two daughters, Terry Wolford and Donna Allender, and two stepsons, Ronald Ward, and Donald Ward. Jack attended the schools of Randolph County and had worked as a self-employed general contractor. He was an avid gardener and enjoyed being outside and watching the birds. He was a member of Irons Chapel. He loved his family and will be sadly missed. A visitation will be held at Hostetler Funeral Home on Wednesday from 5 pm until 8 pm. Funeral services will be held at the funeral home chapel on Thursday, January 24, 2019, at 11AM. Rev. Mike Lantz will officiate and Interment will follow at the Parsons City Cemetery in Parsons. Memorial contributions may be made to Irons Chapel Church, c/o Pauletta Ramsey, 144 Brooklyn Heights Road, Parsons, WV 26287. To send flowers or a remembrance gift to the family of Harry "Jack" Jackson Allender, please visit our Tribute Store. "Email Address" would like to share the life celebration of Harry "Jack" Jackson Allender. Click on the "link" to go to share a favorite memory or leave a condolence message for the family.